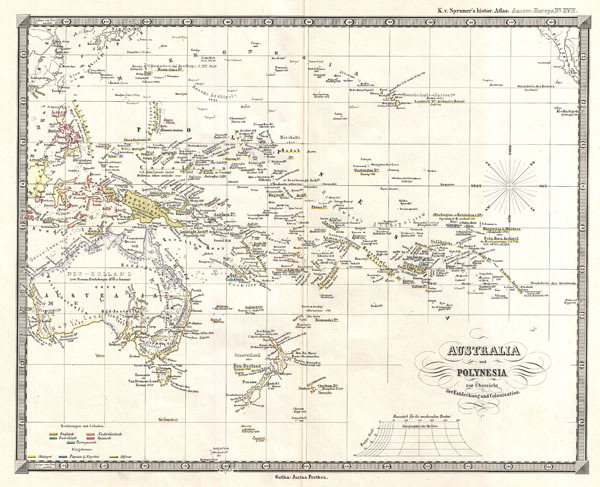 This is Karl von Spruner's 1855 historical map of Australia and Polynesia, with an overview of discoveries and colonization. Covers the area from Australia to California (in the upper right corner), and from China and Japan in the north to New Zealand, Auckland and Macquarie Islands in the south. Dates of discovery and discoverers names appear throughout, making this map is invaluable to anyone researching the history of discovery in Polynesia and Melanesia. Relief is shown by hachures, and the whole is rendered in finely engraved detail exhibiting throughout the fine craftsmanship for which the Perthes firm is best known. Justus Perthes published the map as plate number 18 in Dr. Karl von Spruner's 1855 Historisch-Geographischer Hand-Atlas zur Geschichte Asiens, Africa's, America's und Australiens, also known as Histor. Atlas. Ausser Europa.